From the 8th to the 11th of November 2016, Cogito Group will be exhibiting at the Military Communication and Information Systems Conference (MilCIS). 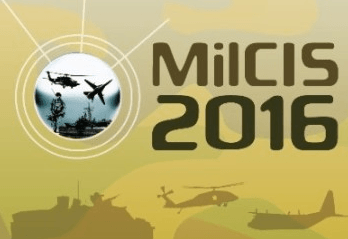 MilCIS is a unique opportunity for those investing in government and military communications and information systems. In addition to keynote presentations, technical presentations, panel discussions and tutorials, MilCIS features an exposition that provides an opportunity for exhibitors to demonstrate new technologies and promote their products and services to attendees. MilCIS is the only Australian conference that focuses strategically on the crucial technologies, products, systems and services associated with military communications and information systems. Cogito Group will be at booth 002 and we’d love you to visit us. Richard Brown, Managing Director of Cogito Group, will be presenting on Tuesday 8th November 2016 at 1.30pm. Richard will be speaking on Cloud Security: Constant Innovation without Constant Capital Expenditure. Enterprise-level protection is now possible at costs that make it accessible to organisations of all sizes. Importantly cloud security services are able to adopt new innovative technologies, such as improved threat protection, without waiting for an upgrade cycle. Richard will explore the Authentication as a Service case study adopted by the New Zealand Government.